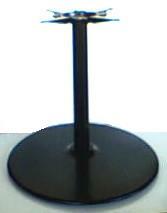 Round smooth surface cast iron restaurant style table base. 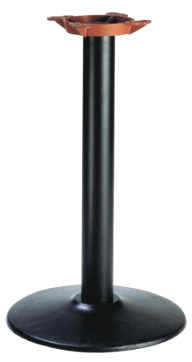 Available in 17",22" & 30" bottom base diameter. - Standard dining height at 28" or Bar height 42"
Determine the right table base for the size and shape of your table top below, then email or telephone us with your request. Rectangular tables - 1 Base: 18"x24", 2 Bases: 24"x84", 3 Bases: 24"x96"
Rectangular tables - 1 Base: 24"x30"to 30"x36", 2 Bases: 24"x48" to 36"x84"
Rectangular tables - 1 Base:36"x42"to 36"x60", 2 Bases: 36"x96"
Maximum Table Top size at Bar height 52"
I just wanted to send you an email to say thank you for being such a reliable, helpful, and detailed vendor. I was speaking with a couple of my co-workers this morning and I said, ï¿½Stable Bases is flawless". So I think I should let you know that, too, because thatï¿½s a pretty big deal ! It makes our lives so much easier because we can rely on you to deliver the product on time, consistently. I believe itï¿½s important to pass along good feedback. I wanted to pass along my gratitude and appreciation for what you do.